Here’s a truly Canadian tale. First, let me preface this piece by saying I’ve been on the fence about ebooks, hung up mostly on the fact that they’re not books in the physical sense. I’m not morally opposed to ebooks, but after playing with Kindle, Nook, and Kobo in-store as well as Kindle for PC and Kobo for iPad, etc., I’m just not convinced that — for me — they could ever replace the reading experience a real book gives. However a recent chain of events made me realize how utterly perfect ebooks are for a country like Canada. Canada is an interesting place, literaturely speaking. I suspect that we have more novelists per capita than any other country in the world. Much of that might be thanks to the great support of things like the Canada Council for the Arts grants and the Ontario Arts Council. We’re likely near the top for readers per capita too. It’s just that our capita cap is less than 35 million. Even lower when you factor in kids and non-English readers. It’s simply not enough to support our writers fully. The result is that except for the Atwoods and the Couplands, publishers usually do small print runs. Another important aspect of the literary scene is that Canada has a very award-centric readership. The difference between winning the Giller Prize, in one case at least, was the difference between the 800-copy initial run, and at least 30,000 after it won*. It’s like the Canadian version of the Oprah Book Club. I guess it’s not surprising – in a country with so many writers and so (relatively) few readers, any direction as to what is the crème de la crème would be pounced upon faster than Margaret Atwood at a book fair. Cary Fagan began his career writing short stories before moving on to novels as well as numerous books for children. Yet he has never given up his love for the story form. Here are ten new stories whose characters are funny, serious, peculiar, and absorbing — as only Cary Fagan can write them. Covering a wide range of human experience with humour and grace, My Life among the Apes is a testament to Cary Fagan’s mastery of his craft. If this accomplished writer can’t get his latest book noticed – even stocked – without being nominated for an award, what chance does the average writer have? Just out of curiosity, I took a look to see what other hard-to-get books were on this year’s Giller long list. As it turns out, a lot. Of the 13 titles, six were not immediately available for purchase. Almost half. The longest wait was “3-5 weeks” to order. That’s why ebooks are perfect for a country like Canada. All the challenges with printing, distribution, and other barriers are not a concern. It is there, immediately. In your ereader. The publisher gets instant cash, the writer gets another sale to his or her name, and the reader gets immediate access. Not only that, these same benefits open up new international markets – it is much easier to sell an ebook to someone in South Africa, for example, than to send physical books there. Except here too there is a hiccup. 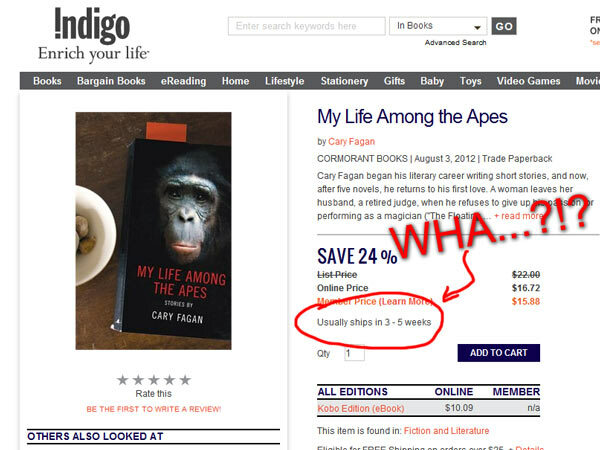 Publishers, especially in Canada, seem to be a little slow on the ball when it comes to ebooks. Initially, I couldn’t get “My Life Among the Apes” in ebook form (not sure if it was available and I missed it, but I couldn’t find it), though it did pop up as an option that weekend. I downloaded it, and was reading it Monday evening. That’s what I think the greatest glory of the ebook will be, in Canada anyway: instant availability, instant scalability, instant portability – especially when it comes to distribution. Now, for the first time, there will be a seamless wait time between demand and fulfillment, between wanting a book and getting it. From the publisher’s point of view, between successfully marketing a book and actually selling it. But will Canadian publisher embrace the ebook? Publishers around the world have shown themselves to be somewhat cautious at the very least to enter the realms of new technology. However, I think it’s inevitable that they’ll have to start doing a better job of making ebooks available and even promoting them as ereader popularity grows. There will be a lot of people – me included – who will still prefer the solid heft of a real cover-and-pages book. But given the choice between an ebook and not reading a book at all, the ebook will always be the clear winner. *I talked about The Sentimentalists by Johanna Skibsrud here previously, and the difficulties of getting that book into the hands of readers after it won the Giller Prize in 2010. This entry was posted in OTF and tagged a few strong words, Canadian publishing, Cary Fagan, Douglas Coupland, ebooks, Graham Strong, Johanna Skibsrud, Margaret Atwood, My Life Among the Apes, novel writing blog, The Sentimentalists. Bookmark the permalink. I’ve never replied to a blog post before, but you’ve touched on a subject that is, ah, close to my heart. Like all writers, it concerns me when my book is hard to get hold of, especially at a moment when people are actually looking for it. First, when you first went to the book store “My Life Among the Apes” hadn’t been released yet. Neither had one or two others on the list. (They need to be published by Sept. 30 I believe.) But if you’d gone five or six days later, you’d have found it. Yes, copies are in the store waiting for you (and you and you) at this very moment. As for Indigo, frankly I don’t get it. If you check Amazon.ca you’ll see it’s listed as “in stock”–to be shipped immediately. And it has been since a week after the announcement. I believe that Indigo has copies, too, and that an order will also ship out immediately, despite what the web site says. (I don’t know for sure, but suspect that this is what the site says for all the books coming from a particular distributor.) In fact, it’s my experience that their web site isn’t kept up to date. That said, ebooks do have their uses. My wife Rebecca gave me a reader for my birthday this summer and to my surprise I rather like it. Yes, I like actual books a lot more. For every book I read on the kindle, I read twenty printed books. But it’s pleasant to read on one of those things and remarkably convenient, especially for travel. I too want to read the Giller nominees and am reading some as print copies and others (usually when the price is cheaper, which it isn’t always) on the reader. There’s nothing more frustrating for an author than hearing “I really want to read your book but I can’t find it.” This, however, is an age-old problem. I suppose the real problem is that we fear readers have very short attention spans. If they can’t find our books right now, they’re just going to give up. I hope it isn’t so. In any case, happy reading. Hi Cary — welcome to the blog! Honoured to have your first comment. That’s interesting that your book hadn’t been published yet. I thought I read August 3 as the publication date — maybe it was a misprint? In any case, that would explain why it wasn’t available in any bookstores, and why it seemingly popped up on Kobo Books suddenly days later. However, in this case I’m not sure it’s a matter of “short attention spans” so much as “here’s another interesting book I could get instead…” As I mentioned above, there are so many good books out there, and only so much money and/or time to read them. I’m glad I persevered looking for your book though — it has been happy reading. I love the underlying synchronicities in all the stories (and I appreciated the shout-out to Thunder Bay, btw). My favourite so far is the title story — I know exactly which National Geographic issues you’re talking about. Spent many hours myself looking at those Jane Goodall pictures of the chimpanzees, studying the family lineages, etc. Reading this story really brought me back to that! Thanks for chiming in — great to hear your own perspective on the book. And “break a spine” with the Giller! I’ve gone over to the dark side. Last year I read 60-something books — the vast majority of them ebooks. Convenience is clearly a factor, and not just on the buying side. And yes, I think doing away with “Out of Stock” notices will prove to be a good thing for authors (though only if they don’t get hooked into some of the rapacious digital rights contracts being offered by publishers). I read a lot about folks preferring the “heft” of a book, but I’ve come to prefer the e-versions, and for a lot of reasons. First, I’m at a point in my life where I’d rather read books than store them. Ebooks meet that need quite nicely. Second, I think they’re simply more convenient. My tablet and ereader lay flat, and flipping pages is a lot more comfortable than holding a book open and turning the pages by hand (especially in bed). The rapid growth in ebook sales is due to a lot of reasons, but I think you can’t ignore the fact that a *lot* of us find them easier to buy, read and store than print books. Just saw this by screenwriter John August. I tend to agree. That’s interesting. To me, it was always the aesthetics of a library — or at least bookshelves — that was the draw. Not to show off, not even to surround myself with knowledge. It’s like the post I wrote not long ago about the Bookstore at the End of the World — there is just something about being surrounded by books that puts me in my happy place. eBooks have a lot of advantages, as you’ve named above. Noël and I were just talking the other day how great it would have been to have an ereader when we travelled through Africa rather than lugging upwards of eight books at a time in our backpacks. I also believe that ebooks will be the norm in the future, and I’m not trying to fight that either. But personally, I think I’ll always prefer books. I definitely feel like when we put down book-books for good something will be lost, just as something is lost from no longer pulling the record out of its sleeve and reading the dust cover, or twirling the dial on a phone. Whether or not those are things to be missed — especially in the face of digital convenience — is a different matter. I like books, until I realize I have to move/dust/store them — and that I’m only typically going to re-read a dozen of them in the shelf. Then again, we’re trying to make sense of life with two mess monsters climbing all over things, and when I see the four big bookshelves in my office (something I always imagined I wanted), I realize I’m only regularly accessing four of the 28 shelves. The rest might as well be on the far side of the moon. So yeah. Ebooks for me. But then, I live in a rural part of the world, where I suffer the same poor access to services as many Canadians (who are presumably to polite to whine about it like I am).